Times Higher Education recently reported about an online survey on research integrity of British scientists. The study was performed and evaluated by Joanna Williams and David Roberts, two scientists at the University of Kent (their full report here). Interestingly, they not only assessed scientists’ own self-reported research misconduct (this being a topic where scientists tend to be less than perfectly honest), but also the so-called “unmatched count”, which “allows respondents to indicate malpractice without specifically implicating themselves”. The sad, but hardly surprising results: one fifth of the respondents acknowledged having fabricated their research data, one out of seven admitted committing plagiarism, and more than a third “reported having published extracts from the same piece in more than one location”. Self-plagiarism is a convenient tool to boost one’s publication record without doing any proper additional research. This is why many academics see extensive copy-pasting of one’s previously published text as a form of misconduct. Of note, this behaviour has nothing to do with occasional repetition of standard formulations or methods descriptions. However, when I reported in April 2016 about certain excessive cases of self-plagiarism, some of my readers strongly disagreed these were anywhere near research misconduct. They showed a more relaxed attitude to self-plagiarism, especially where literature reviews were concerned. Many even reject the term, and prefer to speak of ‘text re-use’, for the purpose of spreading own knowledge and ideas to reach wider masses. From this perspective, which many journal editors seem to share, exact double-publishing of the same review or opinion paper is still frowned upon, but it is enough to introduce some additional paragraphs or a slightest modification of focus to avoid a retraction. “In that case, I’m a serial offender. I don’t recall having used intro/disc sections in research papers, but I get invited to write more review papers or book chapters than I have material for or am motivated to. I try to decline as many of them as I can, but if I’m invited by a friend or mentor, it’s not that easy to decline. As the audience is different for each journal (and I suspect almost non-existent for book chapters), I recycle much of my previous chapters/reviews in the new ones, maybe updating them with new references. One of the persons inviting me even recommended doing just that in order to coax me into accepting their invitation. I like Brembs’ comment, because it helps to understand why scientists feel the need to self-plagiarise in the first place. Part of it is surely personal vanity. However, academics are evaluated after their publication output (often in purely quantitative manner), also literature reviews and anything else with any semblance to the ‘peer-reviewed’ stamp of approval counts (hence the ongoing popularity of the Swiss publisher Frontiers). Book chapters look very smart on an academic CV, and since no one according to Brembs reads those anyway, they can probably be safely self-plagiarised ad infinitum. The general attitude is that self-plagiarism hurts no one, but nicely aids one’s own academic career. One could ask, if someone would really be excited to keep discovering any even the most informative and mind-blowingly clever review or opinion piece published again and again in different journals, especially given that scientific literature is already chocking on those. Every scientist in dire need of first- or last-author publications writes a review or a “perspective” article, while certain editors relentlessly invite their publishing colleagues to submit yet another review on their research topic, just so the journal gains some big names. Finally, reviews are often more often cited than original research, which makes publishing them very lucrative if an editor wishes to game the journal’s impact factor. Self-plagiarism therefore benefits both the authors and unscrupulous journal editors, but is it really that harmless to science? Same self-plagiarising authors would surely be upset about their own money wasted if a paperback novel they bought to read on a conference trip were to turn out to be very similar to what that same author published only last year. They might even demand their €10 back from the bookseller. Yet these very scientists do not at all mind spending hundreds and thousands in public money to publish their self-plagiarised works repeatedly, simply because it is for a good cause: their own self-promotion. And this self-promotion pushes aside all their honest colleagues, whose self-plagiarism-free publication records may look less impressive when jobs and funding are distributed. It is the task of the journal editors to spot and reject self-plagiarism, while demanding of authors to submit original texts only. Many journal editors shy away from such editorial actions, and certainly are reluctant to retract copy-pasted papers from their journals, especially when big names or personal friends are concerned. Some don’t even screen submitted texts for plagiarism, and if they do, they often do not mind the re-use of own texts. Luckily, some journal editors see it differently. The authors would like to express their most sincere apology to the editors and readers of the journal”. “We were alerted about the similarity of the article with other publications from the same authors. After a thorough investigation and following the COPE guidelines the Editors in Chief made the decision to retract the article”. “Self- plagiarism is nothing but a reflection of the author laziness, and a breach of contract with whomever holds the original copyright”. How to deal with self-plagiarism is apparently up to the individual journal editor or institutional responsible and their individual understandings of research integrity. This letter is in response to your email to Minister MacAulay regarding your complaint against an Agriculture and Agri-Food Canada (AAFC) scientist. The Minister has asked me to respond on his behalf. All AAFC employees are subject to the AAFC Code of Values and Ethics. Given the specific nature of their work, our scientists also hold themselves to the highest scientific ethics and integrity standards set out by AAFC Science Ethics Policy Framework. The Framework implementation is overseen by the Science and Technology Branch’s Science Ethics Committee. AAFC does not take allegations of scientific misconduct lightly. All AAFC science publications are reviewed both individually by AAFC management, and by the journals in which they are published, and from time to time as a body of a scientist’s individual work. No issues with Dr. Debnath’s work have ever been found by such reviews. We also have an obligation to our employees to protect them, and the Department from unsubstantiated claims of misconduct. As you have given us no cause to further investigate Dr. Debrath’s publications at this time, we ask that you desist from spreading innuendo regarding his work”. “I can assure you that I am treating this very seriously and I hope to be able to respond to your questions soon”. I am still waiting for his answer. Good thing I was at least not accused of “spreading innuendo”! In addition, AAFC has a Science Ethics Policy Framework that guides and supports our employees working in the science field. I have included a copy of this 2013 framework which is due to be updated this year. We agree that self-plagiarism is an emerging topic in the science world; as such, we will be mindful of this subject while reviewing the framework. You will also note that within the framework there is a section that addresses investigations when non-compliance has been reported. As part of the investigative process, recommendations are suggested and actions may be taken. AAFC is a scientific organisation that believes strongly in the internationally accepted peer-review process. As such, we rely on the in-depth review processes that are set out by scientific journals, and AAFC directors work extensively with researchers under their supervision to ensure their work aligns with AAFC’s mission and mandate”. Actually, “Book chapters look very smart on an academic CV” is not true in some fields. In Brembs’ field (which I think is more or less the same as mine (behavioral neuroscience), book chapters hardly count on a CV. It shows that some people (the book editors) have a good opinion of you, but not much more. The same goes for meeting abstracts. I have even stopped listing those on my CV, as nobody cares about them anyway. And with such abstracts, I too have been guilty of self-plagiarism. My work is in the field of behavioral neurogenetics and may be of interest to specialists in behavior genetics, but also to more generalized behavioral neuroscientists. But if I present a poster or talk at a behavior genetics meeting, behavioral neuroscientists are unlikely to hear about it and the other way around. So I have never really seen a problem with presenting very similar abstracts on basically the same data to more than one meeting. Again, however, I’d like to stress the field-specific circumstances: neither in behavior genetics nor in behavior neuroscience does anybody care much about meeting abstracts. Things are certainly different in, say, computer science, where presentations at meetings count as much if not more than articles in peer-reviewed journals. And book chapters are much more important in the humanities, where most work is actually published in books, not in journals. Brembs is perhaps a bit too pessimistic about people not reading book chapters in our field, I know I read them 🙂 But look at it this way. Suppose you have a nice rounded book prepared and you need one more chapter on a specific subject to have the book cover an area comprehensively. The one person most suited to write this has just published another book chapter or a review article on that very subject. You now have the choice between publishing a book with a hole in it, or accepting a book chapter that is perhaps not all that different from another one. As long as things are clear (adding a statement like “this book chapter is based on…” at the end), I think I prefer to have a rounded book, instead of a book with a hole in it. Having said all this, I think that each case has to be judged on its own merits. I grew up scientifically before there was an Internet and if you published in a certain journal, people in a somewhat different field might not see what you had to say, no matter how important. So I kind of felt obliged to present my work at different meetings, even if that meant publishing the same abstract multiple times. Nowadays, with big searchable databases just a mouse click away, it is much less important where you publish something. People who are interested will find it, even if it’s in the Nauru Journal of Hidden Research! And I am also talking about re-using a book chapter at most one more time (and certainly not in identical form, because that would violate copyright). Re-using the same material multiple times, especially re-using the same experimental material several times remains to me a big no-no, as it falsifies the scientific record. This has become a bit muddled, I fear… 🙂 So let me repeat my main point that things are different in different fields and that each case should be judged individually. “So I kind of felt obliged to present my work at different meetings, even if that meant publishing the same abstract multiple times.” : this is very, very common. Suppose you have a nice rounded book prepared and you need one more chapter on a specific subject to have the book cover an area comprehensively. The one person most suited to write this has just published another book chapter or a review article on that very subject. “Strategies to Target Mitochondria and Oxidative Stress by Antioxidants” (Marvin Edeas, Anne-Sophie Mailfert) — chapter 151 in “Systems Biology of Free Radicals and Antioxidants” (2014, pp 3419-3435). For several decades, many antioxidants studies have emphasized the marked disparity between the beneficial effect of the antioxidants shown in preclinical studies and their inability to show beneficial effects in clinical trials. Besides, it is not uncommon to find highly contradictory clinical results, which may explain why consumers are less enthusiastic for antioxidant uses. Many antioxidants have shown a marked disparity in their beneficial effects in laboratory studies and their inability to demonstrate beneficial effects in clinical trials. Moreover, it is not uncommon to find highly contradictory clinical results, which may explain why consumers are less enthusiastic about the use of antioxidants. I guess Springer hold the copyright already, so if they are happy about recycling the material, who are we to cavil? If the chapter is indeed basically unchanged, I would at least expect to see a clear acknowledgement of this (and an explanation why a new author suddenly appears). In addition, if that book chapter was produced several years after the article was published, I would at least expect that the authors had included any important references that had been published since and updated at least some parts of their manuscript (if this was done by the new author, that would explain the addition). If none of these things was done, I would not find this acceptable. Re-using abstracts from conferences is OK, they are not truly peer reviewed publications and in my opinion should not be included in a CV, they do not mean much anyways… As per book chapter, like the example presented above, something gotta be wrong with such a procedure…at the end it only subtract value to book chapters, which no many people read these days. If you are invited to write a chapter in a book from Springer (or Elsevier or similar) it is ONLY because somebody more important declined the invitation. Don’t come with the childish story of “I am so important, that even the editors are OK if I edit previous reviews, as long as they can have my name on their book”… Now, if you are invited to write a review for Nature Reviews or for the Annual Reviews, that’s a different story. Have you been invited to those? (not me!) and if yes, would you also think that it is OK to “just edit” a previous review and send it to Nature Reviews or Annual Reviews???? But if a publisher concedes such benefits to some authors, should not all others have the same benefits? Can’t say I have ever thought about this from a copyright point of view, only from the ethical side. Usually, that is more restrictive than copyright, but perhaps not in this case. If the wording of the article is changed sufficiently, then I think copyright doesn’t enter into this (it’s a bit more complicated for figures, of course). Many copyright transfer agreements allow authors to re-use their own material, provided the origin is given. And nowadays, most publishers don’t ask for copyright transfer any more (at least not for journal articles, book chapters is another matter), but have replaced this with a licensing agreement, leaving the copyright with the authors. There was a good deal of truth in the contention that “As the audience is different for each journal…”, even 10 years ago, but that is no longer the case. If one publishes open access, then one only has to publish once, anyone can access. So during this transition of the means and approaches we use to communicate science, rehashing reviews for different audiences becomes less and less useful. Perhaps all that is missing in the current open access publication set up is version control. This would allow a review to be updated by anyone, including the original authors or a part thereof, rather like the classic textbooks. After all, the authors of many classic textbooks are dead, but they still bear their name, since this has become integral to the title. WHat you propose already exists: Wikipedia! I call BS on that whole british suryey! Look at the sample size of that survey. That is totally not a representative sample, therefore the whole survey is BS. But your discussion about self-plagiarism of course is not. Self-plagiarism is an accepted state in plant science and horticulture. This is undeniable. And this is beautifully exemplified by the formal approval of the Canadian Minister of Agriculture of Debnath’s literature. Debnath, to many of us horticultural scientists, was a role model and leader, and I think many felt that if it was OK for him to self-plagiarize, without impunity, then any horticultural scientist could self-plagiarize. And this is a very key issue. Self-plagiarism is clearly accepted in horticulture, as also exemplified by the fact that Dr. Debnath retains his position as editor of the world’s most powerful horticultural journal, Scientia Horticulturae, published by the world’s most powerful science publisher, Elsevier. And the fact that self-plagiarism is totally acceptable is further confirmed by the fact that Scientia Horticulturae and Elsevier are COPE members. COPE is the Committee of Publication Ethics, the most powerful ethical body in the world. The fact that Debnath can retain his position, his salary, his grants and his status quo speaks volumes why nobody cares, or why nobody wants to take action, because it would literally involve shooting themselves in the foot, as I have come to learn in recent weeks. So, the horticultural community (and by analogy the wider plant science community) prefers to sit in silence because it has embraced (by not denouncing the practice) self-plagiarism as an acceptable part of the publishing model. As long as we have a leadership and status quo that openly embrace and support self-plagiarism, how can we hold anybody accountable in plant and horticultural science, including ourselves? 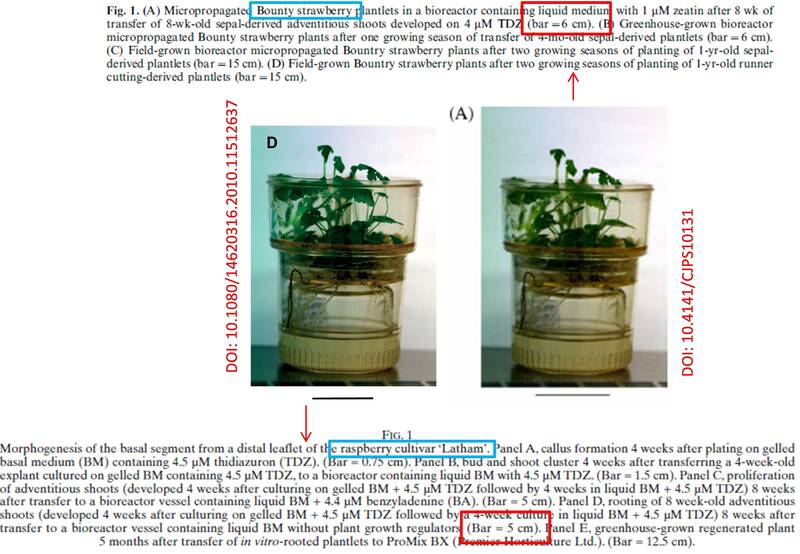 This culture of acceptance of self-plagiarism in plant and horticultural science is fortified by the fact that none of the almost 20,000 plant scientists I contacted did not take any action, even a year after informing them of my concerns, including about the ISHS and Acta Horticulturae, and have preferred to sit in silence (and thus direct approval of self-plagiarism). The 20,000 plant scientists I contacted directly by email did they make any request for Debnath to correct his literature or step down from his powerful and salaried positions. I then ask, if self-plagiarism is acceptable in horticulture and plant science, then why should we correct duplicated or self-plagiarized work, especially when the powerful “ethical” horticultural journals, the powerful “ethical” publishers like Elsevier condone it, and when COPE fails to declare it unethical? COPE indeed is “the most powerful ethical body in the world”. But is COPE itself ethical? Michael, indeed. And, at that time, the COPE Chair was Elizabeth (Liz) Wager. I have a Wager folder from that time, her blog where she said men are lying more than females, her comments in Times Higher Education on “handling” of my case, etc. I looked at the summaries of their cases and decisions. They are utterly unscientific, with the language of a child with the clinical case of learning disability. Public knows only their rules which look good, but again – infantile. Their definition of plagiarism started with “Plagiarism ranges from…”. That’s not a definition. It’s a mystery, how they reached such position in the administration of science. Apparently, they came very convenient to the establishment that up to now strives to downgrade (and amazingly complicate) language, procedures and science itself. I believe that one can “self-plagiarise” for as long as journals publish it. It may happen that public will stop reading it past his 350-th article and even blog about it, but that’s his problem. The solution of the real, serious problem with “self-plagiarism” must take place in the department which, instead of just counting the papers, must require submitting one’s two-page summary of his scientific achievements with references to papers, and make the career judgement accordingly. 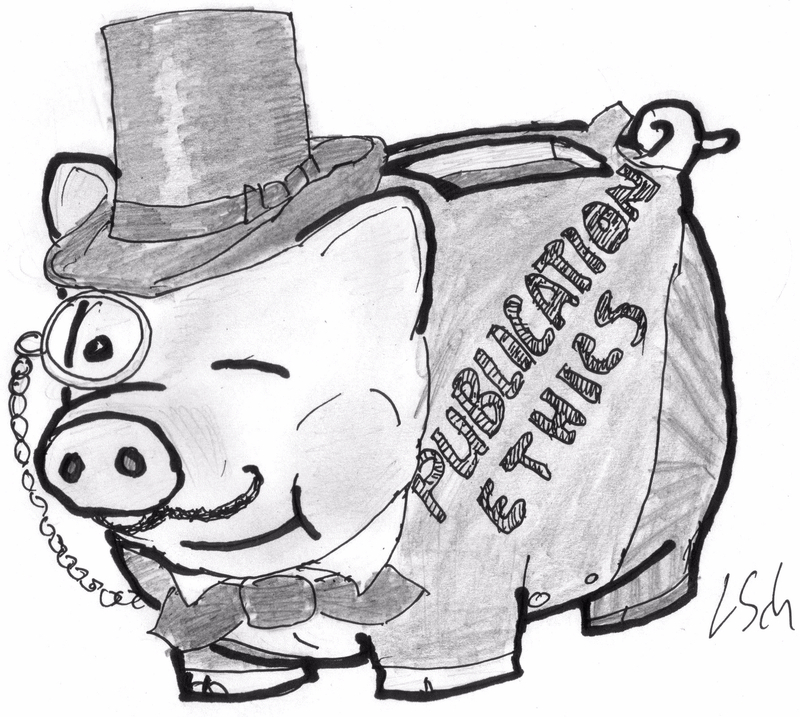 Wager represents the perfect face of cronyism in science publishing ethics. A nice smile, a kind personality, gentle commitment to both scientists and science critics. Wager took COPE to new heights of the exploitation of ethics, turning “ethics” into Big Publisher’s new marketing tool. Swallow a COPE pill, which of course does not come cheap, and you get protection from big powers. A pharma industry insider leading science ethics. That is a joke. And the baton has been passed onto someone even worse. These are not academics. These are non-scientists who are creating rules for scientists, preaching to them, and then gauging their responses to fine tune their ethical cancione. And scientists are swallowing this nonsense hook, line and sinker. Follow the money trail and you may begin to see how corrupt COPE truly is.